* On Sunday, yet again, Drew Brees did what he mostly always does: coolly delivered in the clutch. Backed up to their eleven yard line and trailing by 4 with 7:06 remaining, the Saints' offense followed Brees to the winning score. Brees drove the Saints 89 yards in 13 clock-killing plays to give the Saints the lead with 50 seconds to play. 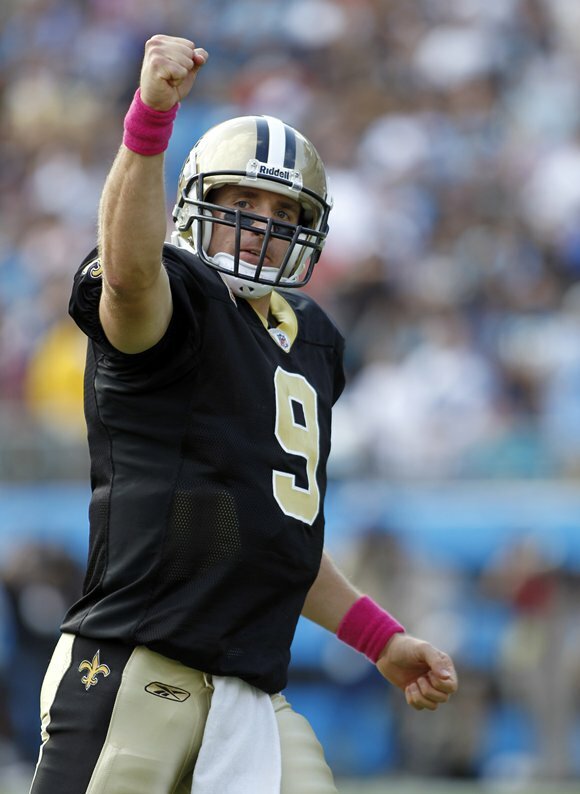 On the day, Brees completed passes to nine different players at a 71% clip for 359 yards and two TDs. Just another day at the office. That Brees so effortlessly manages the varied situations, so unflappably maintains his poise amidst the increasing noise, and consistently unlocks opposing defenses--and moreover that this continued greatness is almost, by now, rote to Saints' fans--is to watch a master at the absolute peak of his craft. Week in and week out, it's a sight to behold. * The prodigious Jimmy Graham has literally become the NFL's best TE right in front of the eyes of the Who Dat Nation. At this point, would Saints' fans want any other TE? All game long, Graham tortured Panthers' DB Charles Godfrey who drew the unenviable task of defending Graham. For the third consecutive week, Graham topped 100 yards receiving, this time on a team-leading 12 targets. Officially, Graham caught 8 passes for 129 yards. Furthermore, Graham's three consecutive 100-yard games mark the longest streak for a TE since Tony Gonzalez went four straight games with 100+ yards in 2000. Through five games now, Graham is fourth in yards, second in total catches, second in first-down receptions, third in targets, and number one in headaches for opposing defenses (see what I did there?). * The Saints' offensive balance and efficiency remains a fundamental strength. On the day, the Saints topped the 100-yard rushing mark, converted an astounding 71% of their third down chances, and controlled the clock to the tune of a nine-minute advantage. The balance on display allowed the Saints to utilize their full complement of weapons and keep the Panthers guessing all day. During the 2011 offseason, we identified that the Saints were 34-4 under Payton when the offense logged 27 rushing attempts or more. Against the Panthers on Sunday, the offense registered 28 rushing attempts, eclipsing that relevant benchmark and grinding out a victory. * For the first time this season, penalties played a pivotal role in the game. The Saints were penalized nine times for 82 yards. The Saints incurred two roughing the passer penalties on third downs in the fourth quarter, breathing life into the Panthers' comeback. In the Saints' defense, one of the calls appeared highly questionable if not downright wrong. However, Roman Harper incurred an ignorant late hit on Steve Smith in the end zone, then was later flagged for pass interference on fourth and 10 late in the game as the Panthers tried to get into FG range for the tying score. Additionally, Mark Ingram received an unsportsmanlike conduct penalty for celebrating his TD. Coming into the game, the Saints were the sixth-least penalized team in the league, so this rash of penalties seems more like an aberration than a trend. * The Saints' red zone defense continues to be troublesome. The Saints came into the game ranked 26th in red zone defense and on Sunday, the Panthers converted both of their red zone opportunities into TDs. With the continued tweaking of rules to favor the passing game in today's NFL, teams are able to, with greater ease, move the ball effectively between the twentys. If that's indeed the case, then operating efficiently in the red zone is increasingly critical. In short, dominance in today's NFL is likely to be determined in the red zones. And the Saints thus far, both defensively and offensively, have been lackluster in this area. * Perhaps the ugliest facet of this game for the Saints was their passive allowance of big plays. 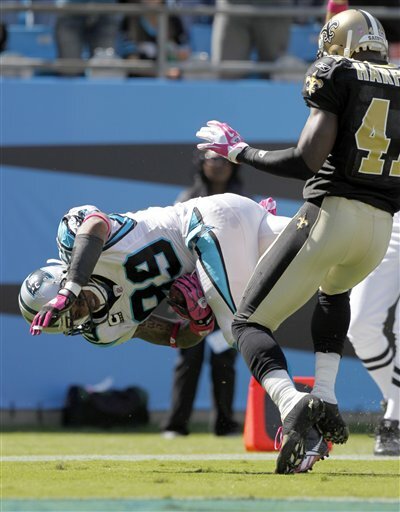 The Panthers gouged the Saints for 7.1 yards per play. For comparison's sake, this ranks almost identical to the Patriots' league-leading 7.2 yards per play and is a full half-yard more than the Panthers' season average. Furthermore, the Panthers averaged 7.4 yards per rush, notched a 69-yard TD run, and completed a 54-yard TD pass. 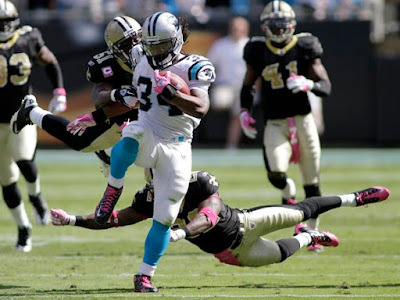 The 69-yard run by DeAngelo Williams was particularly disturbing considering Williams came into the game averaging a meager 3.9 yards per carry, yet managed to gash the Saints for almost 13 yards a tote on Sunday. What's more is that Roman Harper, Jonathan Vilma, and Malcolm Jenkins all missed tackles on the play. In the Gregg Williams' style of defense, this is what you get: a relentless attacking style that leaves the defense exposed to surrendering large chunks of yardage. What Saints' fans shouldn't expect, however, is for three of their best defensive players to miss crucial open-field tackles. As the season moves forward, limiting big plays and playing better red zone defense should be the top two priorities for the Saints defense. I learn so much from reading your analysis every week. It helps me to understand some of (all of??) the fine points of Saints' football.